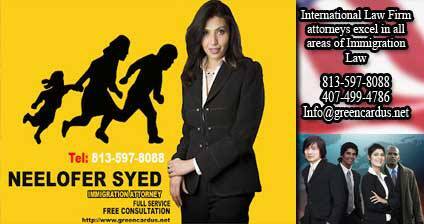 International Immigration Law Firm, founded by Immigration Attorney Neelofer Syed, concentrates on U.S. Immigration and Naturalization Law. U.S. Immigration Law is very complex and keeps changing more often than any other area of law. The complexity and constant changes demand undivided attention from the Attorney, something that the International Immigration Law Firm Attorneys are cognizant of and as a result, they are always current in their knowledge of laws and policies. Being federal in nature, Immigration Law allows us to represent you regardless of where you live and regardless of where the Attorneys are licensed in U.S.